Three weeks ago I had to send back my ‘360, the one they send me was faulty. Iv’e been without a Xbox for 7 weeks this summer, but got a new (well refurbished) one today. I hope this one will last. It was manufactured on May 24th, so it’s pretty new. 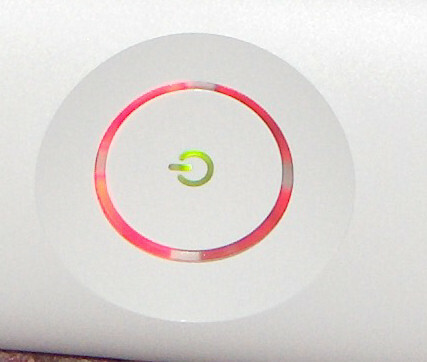 A month ago my Xbox 360 crashed and didn’t start again, the famous “Red Rings of Death”. And today I got it back from repair. I played Burnout: Revenge for about an hour just to test it out. But since we had so nice weather her on the south coast of Norway, I had to get out. Sunny and about +27C. So after a nice day and after watching Germany-Italy (0-2), I wanted to play some more. Well I wish! When I turn the 360 on, I got the three red rings again. And as all FAQs suggest, take all conectors out and reconnect. I did it, just to do it. The 360 wouldn’t start. So I have to call support tomorrow, and probably wait another 4 weeks to get a new (or refurbished) Xbox. But at least, we in Norway have 2 years warrenty (allthough Microsoft says 1 in the manual). So there should be no broblem. I know US only have 90 days (and can buy extened warrenty), and UK and most of Europe have at least 1 year. So we have a pretty good deal here in Europe. It’s summer, so I don’t play so much, but I really want a working Xbox. UPDATE: Talked to the support today. There may have been an error on their side resulting in sending me a wrong Xbox. So now they will send me a new return box and I’ve probably have four weeks to lookforward to not playing my 360. On the other side, the support guy I talked to was a friendly Swede. A Side note: In Burnout: Revenge I’m ranked at 56384 and that’s because the Xbox crashed three times in a row last month when my 360 died. The funny side is that my sister haven’t played Burnout since Easter, and she is now ranked at 6031 and only dropped around 1500 places in three months. So I wonder how the rank system works.